Starts off with three letters of approbation from Cardinals from 1947. An interesting little booklet that discusses the history, method and doctrine of praying the name of Jesus, repeatedly many times through the day. First discusses the wonders of the Holy Name and what exactly saying "Jesus" means. Next follows a succession of historical events where calling upon the Holy Name brought relief and answers to prayers such as the plague in Lisbon in 1432. Then a discussion of Saints who received miracles by specifically calling upon the divine name of Jesus. 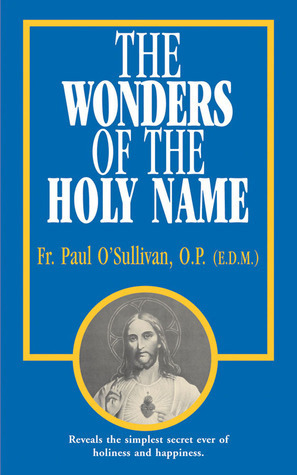 Next the doctrine of the Holy Name is explained and while it is a simple prayer to repeat "Jesus, Jesus, Jesus" for specific intentions or for general prayer, this part tells how one must know exactly what one is calling upon when devoutly saying the Holy Name. I'd never heard of this prayer before and can see myself putting it into practice quite easily as I do call upon the Lord quite frequently. The history was interesting but I did find the section on the Saints could have been written better. It presents the mysticism and miracles as plain facts, when in reality they should have been prefaced with such phrases as "legend has it" or "it has been said" as some of the miracles presented are quite, shall we say far-fetched. Not that I don't believe in miracles, just that the Church gives us the opportunity to make up our own minds about these things. Well-written otherwise and I liked the style from this time-period. The editors did make a few footnotes that updated some of the material. The current edition on the publisher's site is copyrighted 2009, so there may have been more updates at this point. My review is of the 1993 edition. This book is amazing, i read a bit of it every morning! Excellent book for understanding, confidence, and prayer. O what a Name we have to call on. Paul O'Sullivan - Paul O'Sullivan O.P.